Does anyone like metal genre music? Some of you might answer “yes” or maybe some would answer “no” to that question. But, do you know about metal bands in Russia? Or maybe one of your favorite metal bands were from Russia? If you don’t know anything about Russian metal bands, let’s look at 6 popular metal bands from Russia that you must know. Music is considered to be one way to express the mood of the song listeners. There are some people who can come into the song and feel the emotions in each song they listen to. Similarly felt by fans of the song that has a metal genre. Many people think that metal and rock music sound noisy. However, for big fans the song accompanied by metal music, can give fans satisfaction when listening to it. There are a lot of bands around the world who use the tracks with metal music as the identity of their work. Each band must have their own song characteristics. Metal song itself has many types, such as heavy metal, alternative metal, death metal, folk metal, black metal and many other. In this article, I will discuss about 6 metal bands from Russia that you must know. Kipelov is a Russian metal band formed in 2002. Kipelov is originally from Moscow. The genre of the song performed by Kipelov’s band is heavy metal, symphonic metal. Some members of the Kipelov band are former members of the Russian heavy metal band called Aria. In 2002, there was a split from the legendary group named Aria. The group was split into two parts. Three of the Aria members, Valery Kipelov, Sergey Terentiev, and Alexander Maniakin, left the Aria group and formed a new group called Kipelov. The name Kipelov was taken from the name of their leader. Kipelov toured in Russia, Belarus and Ukraine in the autumn of 2002. Sceptre is a Russian metal band that formed in 2006. The band was formed in Saratov. 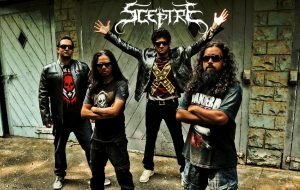 The genre of the song that is owned by the Sceptre band is heavy metal and thrash metal. The band was in a music label called Metalism Records. Sceptre has performed in several cities in the European part of Russia since 2006. Sceptre has released a total of two albums and two singles. The song, titled “The Curse of Merlin” included in the compilation “Now! That’s What I Call Metal 37” in 2011. Sceptre is also supported by other Russian metal bands such as Master, Black Obelisk and others. But unfortunately, the Sceptre band was only active until 2015. Epidemia is a Russian metal band formed in 1993. But in the same year, this metal group did not have an official name. Epidemia is formed by the guitarist of Epidemia, Yuri “Juron” Melisov. And Yuri “Juron” Melisov gave the name Epidemia as the band’s name. The name Epidemia comes from the Russian language for “epidemic”. The band made their first songs in 1995. When they did not have an official name in 1993, Epidemia recorded a demo album called Phoenix. Epidemia has been known for many years as a band that performed at a club that was quite successful. Only then was the band only known by the metal community. Epidemia name became better known after the release of their fourth album, entitled “Elven Manuscript”. The album also starring famous Russian vocalist of metal such as Aria, Master and others. It makes Epidemia into Russian metal band’s most popular. Arkona is a Russian folk metal band formed in February 2002. The band is from Moscow. Arkona band’s name comes from the castle town of the last Pre-Christian. The songs performed by Arkona have lyrics that are greatly influenced by Russian folklore and also Slavic mythology. The music of the band Arkona is a combination of several traditional Russian musical instruments. The Arkona band originally had the name Giperboreya (Гиперборея – Hyperborea). In September 2003, this Arkona band was disbanded. This dissolution was carried out due to the lack of enthusiasm of some of Maria’s colleagues— one of the people who formed Arkona at first. However, she chose to continue with the band and writing material for a solo album. At present, Arkona has three new members who fill the position of guitarists, drummers and bassists. Alkonost is a Russian epic folk metal band that formed in 1995. Alkonost came from Naberezhnye Chelny, Tatarstan, Russia. The genre of songs produced by the Alkonost band is folk metal and doom metal. The lyrics of the Alkonost band’s songs are based on paganism and Russian mythology. While the song’s melody is taken from authentic Russian folk music but has arrangements and riffs from power metal, black metal and symphonic metal. Alkonost band fans started their fanbase starting from a small local fanbase in Russia until now throughout Eastern and Northern Europe. Alkonost is very popular among fans of the heavy metal genre in their home country. After signing a contract with Metalism Records, Alkonost’s album is available in English even though most songs are sung in Russian. Catharsis is a Russian symphony power metal band formed in 1996. Catharsis is from Moscow. Catharsis’s demo album originally played the death doom metal genre, but since their second album titled “Febris Erotica”, their musical style turned to symphonic metal. Catharsis’s album has received many positive reviews in Russian music magazines. Catharsis was chosen to be “1999’s Best Rookies” by Readers of Rock City magazine. Then Catharsis received the Russian Alternative Music Award as the best Russian metal band in 2006. And maybe there are still some of popular metal bands from Russia that haven’t been listed above. I hope this article can really help you to find out the 6 popular metal bands from Russia that you must know. For fans of metal music, which band interests you?